I reached a milestone with the blog posting yesterday being my 2000th!The Holiday Light Show (HLS) ran well last night and saw a moderate crowd for attendance. The weekend crowds will certainly be larger as attendance will build as we get closer to Christmas. The weather was chilly today but nice and sunny. Another warming will occur this weekend and there doesn’t seem to be much chance of a white Christmas. Regardless, the last 10 days of the HLS should experience strong traffic! See www.rotarybotanicalgardens.org for more information on this family-fun event (and fundraiser for the gardens!) Larry H. worked on some odds and ends today including more tweaking out in the HLS based on his observations last night. Bill O. came in to collect garbage and we also saw Maury and Gene. I’m looking at seed catalogs for next year and finalizing some thoughts on our fun color themes and collections in 2016. I’ve always been a fan of Shasta daisies (Leucanthemum x superbum) which have such cheery flowers over a good 10 weeks or so in summer. Pure white isn’t used enough in the summer garden and Shasta daisies are solid performers that are simply beautiful. This plant was developed by Luther Burbank (see article below) who had an amazing life in horticulture/agriculture that warrants more examination and appreciation. 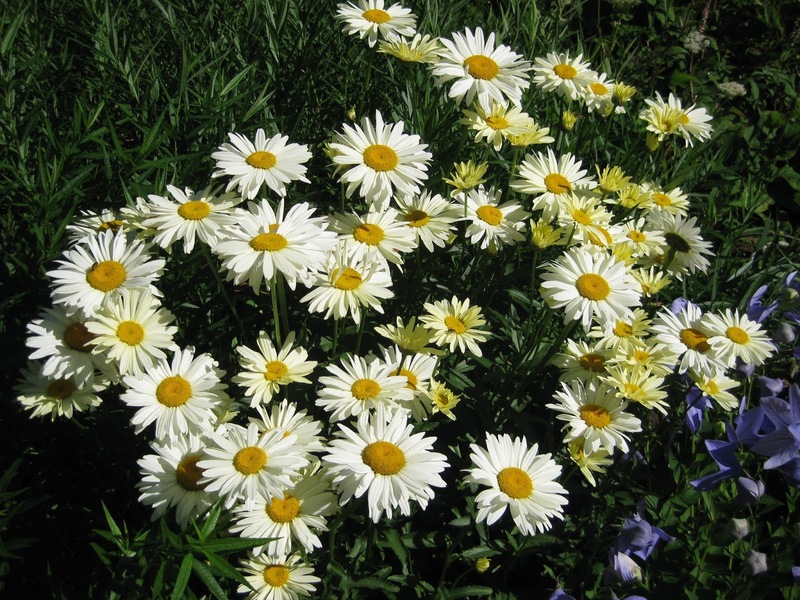 When I first started to garden, the old variety ‘Alaska’ was the standard offering and did well with clear white blossoms on a 3′ tall plant The variety ‘Becky’ seen above really increased the popularity of Shasta daisies when it was named Perennial Plant of the Year in 2003 by the Perennial Plant Association. ‘Becky’ can get close to 4′ tall and is known for heavy flower production on sturdy stems. While most selections are in the 2′ – 3′ range, there are taller varieties and compact varieties around 12″ or so. 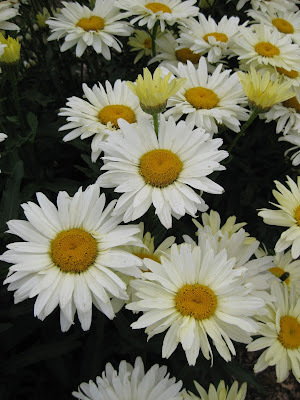 Shasta daisies prefer full sun but can tolerate part sun. Moist, well-drained soils are ideal and consider removing spent blooms (deadheading) to encourage an extended period of bloom. There are occasional insect and disease problems with Shasta daisies and they can re-seed in open soils quite readily. 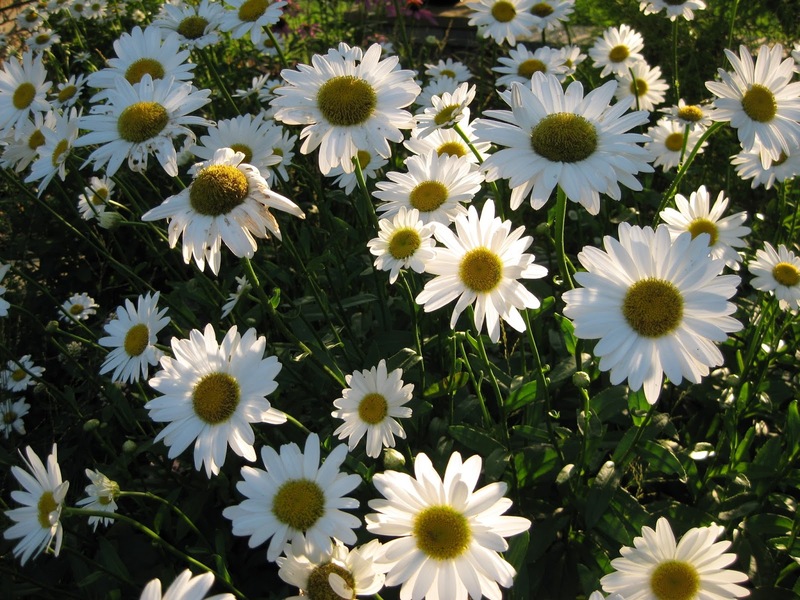 For a clean, white daisy in summer though…they can’t be beat. Modern breeding is creating not only more flower forms (double forms, frills, etc.) but yellow varieties are becoming of more interest. Some yellow varieties will age to a white although some of the newest yellow selections maintain a yellow/cream appearance even on older flowers. The images in this blog (all mine) are just a very small portion of what is available out there. The article below was taken from the two online sources referenced at the bottom. Very interesting…. Luther Burbank had a great fondness for the wild oxeye daisies that grew under the elm tree in front of his family home. Many years later, the young plant-breeder was inspired to develop these wildflowers for use as garden flowers, and envisioned an ideal daisy: it would have very large pure-white flowers, a long blooming period, and do well both as a cut flower and garden plant. In order to achieve his goals he used four different plants. He started with the oxeye daisy (Leucanthemum vulgare) and cross-pollinated it with the English field daisy (Leucanthemum maximum) which had larger flowers than the oxeye daisy. The best of these hybrids were then dusted with pollen from the Portuguese field daisy (Leucanthemum lacustre) and their seedlings were bred selectively for six years. These bloomed nicely, but Burbank wasn’t satisfied yet. He wanted whiter, brighter flowers. 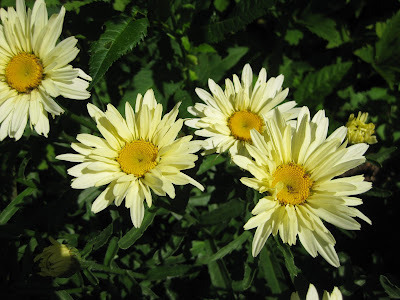 He took the most promising of these triple hybrids and pollinated them with the Japanese field daisy (Nipponanthemum nipponicum), a species with small, pure-white flowers. Finally, he got the beautiful large white daisy that he was hoping for. 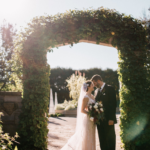 He named it for the lovely glistening Mount Shasta in Northern California. 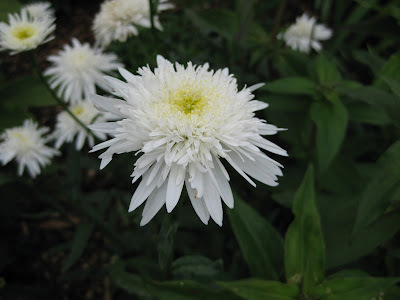 He finally introduced his Shasta daisy hybrids in 1901. In 1901, Burbank offered his new flowers as a mixed selection, the Shasta Daisy Hybrids, naming them for Northern California’s great snow-covered peak. In 1904, Burbank introduced the first named varieties of Shasta daisy including ‘Alaska’, ‘California’ and ‘Westralia’. As late as 1925, he continued to offer new varieties of the flower and further development by plant breeders continues today with over 100 named varieties introduced over the last 112 years. The Shasta daisy has the longest history of continuous popularity of any hybrid American garden flower.